Listen to what gold is saying. It’s not deflation that we have to worry about. We’re about to enter a multi year period of rising inflation. Seriously did you think years of QE weren’t going to have consequences at some point? For a long time I’ve maintained several key macro views. Gold started a new bull market in late 2015. The dollar started a secular bear market in early 2017. Stocks have not topped yet. We still have higher highs ahead. First off, let’s look at the stock market. Did we not learn anything from the last two bear markets? Central banks don’t just stand on the sidelines and watch quietly as everything comes crashing down. They fight back. That means tops in our modern markets form as megaphone patterns. 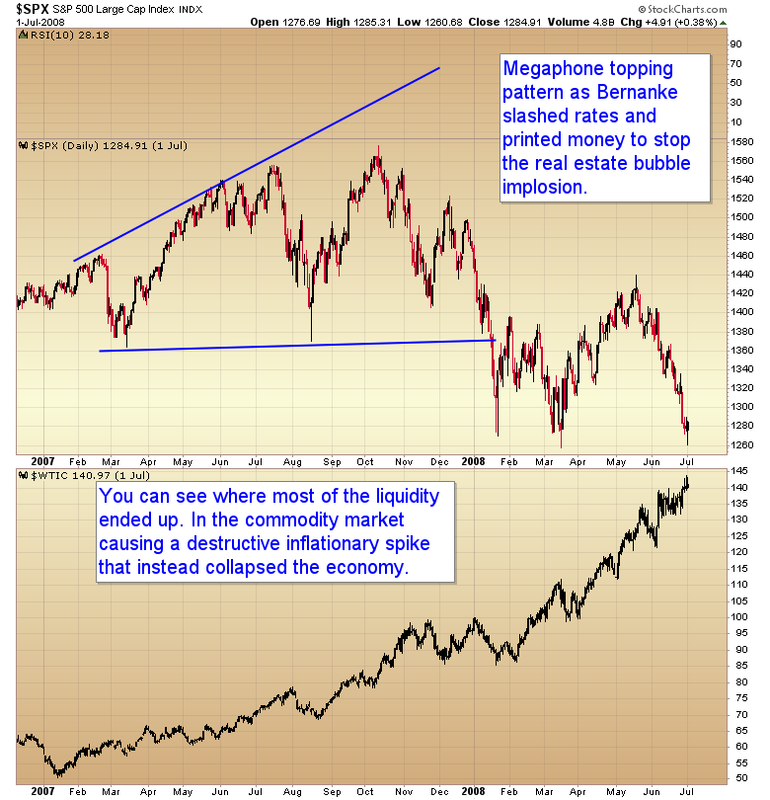 The last top in 2007 was a megaphone pattern as Bernanke slashed rates and printed money in the attempt to prevent the real estate market and economy from unraveling. Ultimately it failed and resulted in an inflationary storm that just intensified the recession. The same pattern is beginning again in 2018. The megaphone top has begun. Now we just need to test the lower zone of the pattern and panic central banks back into reflation mode. This should start with the Fed balking on the December rate hike. 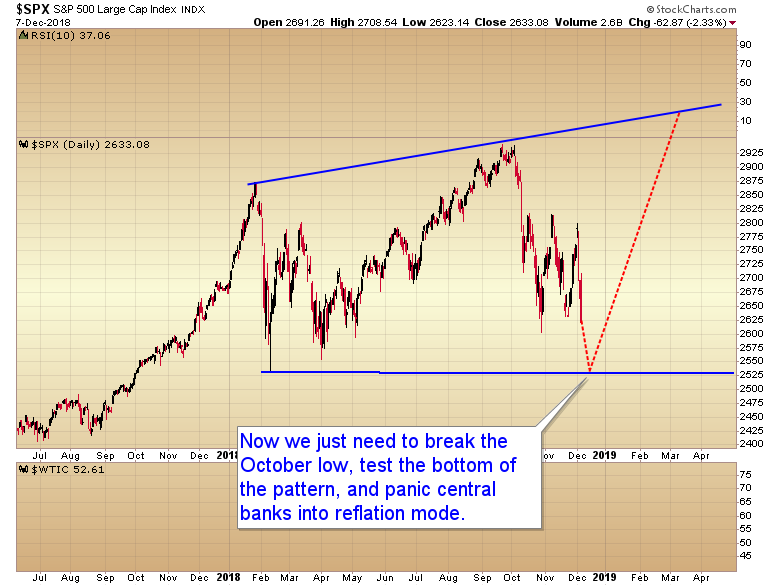 And they will balk if the market breaks the October low next week. This will be the beginning of the end for the dollar. The only thing holding this pig up has been the expectation of continued rate hikes. Remove that and the dollar will be toast. (and if we get a final trade deal with China the megaphone pattern could morph into a melt up). Next let’s look at the CRB. Currently commodities are moving down into a 3 year cycle low. At first glance that would seem to be deflationary. But what most people fail to take into account is what happens after the 3 YCL is struck. Markets reverse and start moving back up. A 3 YCL gets everyone on the wrong side of the market. Looking in the wrong direction so to speak. It pulls the rubber band far to the downside, but what most people fail to anticipate is what happens when the rubber band snaps back. In our current setup the last 3 year cycle has been a long basing pattern. Long basing patterns like this generate powerful rallies. Commodities are setting the stage and building the fuel for a major thrust out of this multi-year base. Wage inflation is running low compared to other recoveries. So, maybe the recession scenario precedes the massive wage inflation expected in 1-2 years. Interesting either way.